In our Master of Business Administration (MBA) program, you will advance your career and find your way forward as you prepare to be a leader in today's global economy with strength, adaptability and a global perspective for today's rapidly-changing business world. These leaders are able to collaborate, find ways past obstacles and see the world differently. The MBA program at St. 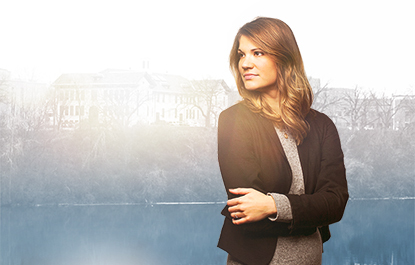 Cloud State teaches students to be these leaders – to lead the way forward. You can do it all while attending classes that fit with your life online, on the St. Cloud campus or St. Cloud State at Plymouth. Learn more about the required MBA IQ self-directed online course. Curriculum combines business theory with hands-on application. Courses scheduled to accommodate employment responsibilities, vacations and holidays to allow students to balance their studies, work and personal lives. Shorter time to completion: Part-time students typically earn their degree in 28 months, while full-time students often earn their degree in just 16 months. Graduate assistantships offered each year for students attending in St. Cloud. One of the most affordable Minnesota MBA programs. Accredited since 1982 by the Association to Advance Collegiate Schools of Business (AACSB), the world’s leading business school accrediting agency. One of two MBA programs in Minnesota that has been accredited for more than 30 years. Faculty all hold Ph.D. or J.D. degrees or are professionally-qualified.